Many consumers treat glass like other products they shop for and simply shop around for the "best" price. But with auto glass, like those same other products, you often get what you pay for. If you want to be sure the materials used in your auto glass replacement are a match to what the manufacturer intended, insist on high-quality glass. We only use OEM (Original Equipment Manufacturer) or OEE (Original Equipment Equivalent) glass in every replacement we do. That means that when we replace the windshield or other glass in your vehicle, you'll be getting glass that is of the same or higher quality than what was called for by the vehicle's manufacturer. Why Choose OEM or OEE Glass? When safety and quality are an issue, insist on ABC Glass. We're sure to replace your glass with quality OEM or OEE glass with any auto glass replacement you need. 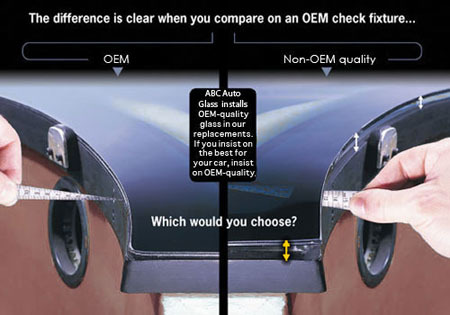 For an easy and free auto glass quote, click here.